While the seconds ticked past Noon today, I was relegated to living the final moments of the 2014 Boston Marathon through the Runner's World twitter account. While the mainstream sports world is wrapped up in the NBA and NHL postseasons, the result of the biggest moment of the biggest stage of "our sport" hung on the balance of continually swiping my finger down on my phone for an update of the final miles of the men's competition. An American was leading late! He couldn't hold on could he? The anticipation was overwhelming! However, this wasn't the first time I had followed along for news of the race on twitter. I had followed twice before on Twitter and as an American fan, the first was disappointing. The second, devastating. Let me explain. My first real draw to the phenomenon known as the Boston Marathon came just three years ago in 2011. I was fairly new to the sport of distance running as a participant myself and my admiration of the race stemmed from the history of the race, tough qualification standards and the Patriot's Day tradition of race support from Hopkinton all the way to downtown Boston. With the lack of television coverage (a topic for another day), I followed along as American Ryan Hall raced through the course out in front. When the leading group caught him, it seemed all but over. However, Hall rebounded, taking the lead once again in the final miles. Was this it? Was this the year that America regained glory on the final stretch on Boylston Street? All these thoughts came in an instant but as twitter updated the last few times, it wasn't to be that day. Hall ran out of gas while still running into the hearts of Americans with a fourth-place finish. It was the fastest time ever for an American marathoner but still wasn't a win. At that moment, I wasn't sure an American would ever win another major marathon, much less the most prestigious of the world in Boston. I just didn't see it coming. What else didn't I see coming? A tweet from Runner's World just a year ago stating "Explosion at Finish Line". This had to be a mistake right? What are they talking about? As we pulled up video on the internet and we began to see pictures that matched these words, my heart sank. I knew people running and near the finish line. Were they Ok? Why would someone do this? How would this change the sport and the people that love it? As that week went on, we learned the answers to many but not all of these questions. While the pain for many lingered and the city took time to recover, the city of Boston and the freedom of America was challenged that day. What would the response be? Where do we even start? 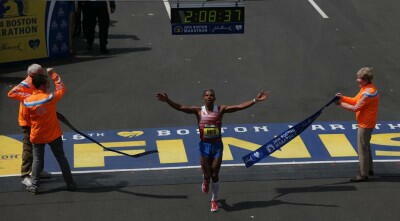 How about in the form of Meb Keflezighi, the first American male to break the tape in Boston in 31 years! How about a women's course record by defending champ Rita Jeptoo of Kenya! How about Boston native Shalane Flanagan running to a tune of an American record en route to a sixth-place finish in the women's race? How about 4,800 runners that were stopped short of the finish line last year, returning for glory by crossing the blue and yellow finish line. How about over one million spectators in Boston taking to the streets to celebrate. It was the spirit encompassed in every distance runner. The will to overcome adversity. The selflessness of running for someone or something. The satisfaction that not much else can bring. Today was all of those things and more as Boylston Street rebounded. Today, twitter left me neither disappointed or devastated. It left me with so much more!